MuscleMeds Carnivor is a really good protein powder that has some very unique things about it. This protein powder has 23 grams per serving, which is a good amount for those looking to build lean muscle. The protein used is not from the typical sources. MuscleMeds Carnivor uses Hydrolyzed Beef Protein Isolate. This is a super unique and quality protein source. Since it’s from pure beef, it contains a great deal of anabolic muscle building aminos. Another great perk is that it has 2.5 grams of creatine per serving. Creatine may help enhance muscle mass and potentially provide bursts of strength during workouts. This protein powder also has branched chain amino acids (BCAAs), which may help reduce muscle fatigue, speed up recovery times, and increase protein synthesis. MuscleMeds Carnivor utilizes Anabolic Nitrogen Retention Technology that may help recycle aminos in the body and lower the amount of ammonia and other waste products. I really like that this protein powder is fat free, sugar free, and only has 120 calories. This makes it a great option for those wanting to build lean muscle. It’s also cholesterol free, which is great. A lot of other protein powders contain a good deal of cholesterol, which is not ideal. The formula is also free of gluten, lactose, collagen, and gelatin. So overall, we gave MuscleMeds Carnivor a 4.5 out of 5 stars, making it an above average protein powder in our opinion. MuscleMeds Carnivor mixes fairly easily into a nice, thick shake. Skip the spoon and go straight for a blender or shaker with this one. We tried the trusty spoon and glass method and it was a chunky mess. It even says so in the directions. I noticed it foamed up tremendously when I just used water. Half of my shaker was filled with foam by the time I was done blending, but the actual shake consistency was still thick. It didn’t foam up as much when I used almond milk but it also ended up with a chunkier consistency. The directions say to mix 1 scoop of protein powder with 6-8 fluid ounces of cold water. We tried MuscleMeds Carnivor in Vanilla Caramel. The thought of pairing beef protein with a vanilla caramel flavor was a little daunting. The taste is sweet, which some people prefer and some dislike. I’m personally not the biggest fan of caramel. There’s also definitely a slight “meaty” taste that’s a little hard to explain. It doesn’t taste like any protein powder I’ve tried. I was surprised though, even when just mixed with water, the taste actually wasn’t bad. I usually opt for a milk alternative like almond milk or coconut milk because it makes it taste a lot better. The overall taste is very different and it avoids having the classic “old school” protein powder taste. For the macros, each serving (1 scoop) contains 23 grams of protein, 0 grams of fat, and 7 grams of carbs. With the recommended 1-2 servings per day, this is a good protein amount for those wanting to build muscle. I’m really impressed with the 0 grams of fat because there’s usually at least a few grams of fat per serving in a variety of protein powders. Low fat and low carb protein powders are always something we like to see. The calorie count is also low, coming in at 120 calories per scoop. Overall, this is a good macro combination for people wanting to build some muscle, especially lean muscle mass. MuscleMeds Carnivor has a lot of great things going for it as far as ingredients go. The sole protein source is hydrolyzed beef protein isolate. This is a unique and quality protein source and the product doesn’t use any fillers. It also has added branched chain amino acids (BCAAs), which may help increase protein synthesis, improve workout performance, promote anabolic effects, and lower muscle fatigue. The 2.5 grams of creatine are a great addition that may also boost muscle growth, strength, and mass. Carnivor uses a special technology called Anabolic Nitrogen Retention Technology that may help recycle aminos and prevent potentially toxic build-ups such as ammonia. This product is FREE of gelatin, collagen, fat, lactose, cholesterol, sugar, and gluten. It also contains sucralose, an artificial sweetener, which can cause digestive issues with some people. I noticed a slight stomachache and some bloating about 30-45 minutes after taking this protein powder. It wasn’t anything crazy but it was a little uncomfortable. After using this protein powder for a while, we’d say it’s best used for those looking to build muscle, especially lean muscle mass. The 23 grams of protein per serving is a great amount to help build muscle and get in that extra needed protein without having to devour multiple steaks at every meal. This is especially true if you take recommended 2 servings per day. Carnivor also has 2.5g of creatine, which is another great addition to help build muscle and aids in recovery. 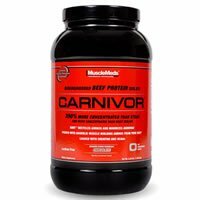 MuscleMeds Carnivor costs $47.99 for a 2.1-pound container. That works out to about 7.45 cents per gram of protein, which is about average as far as what most protein powders cost. I think it’s a great value for the price if you’re looking to build muscle. 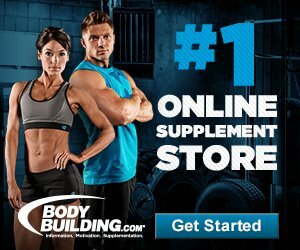 We couldn’t find a guarantee on the MuscleMeds website but you might be able to get a refund if you buy it at Amazon or at certain retailers. To buy MuscleMeds Carnivor, click here.